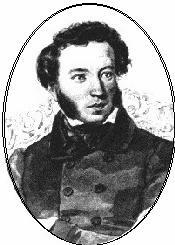 ﻿ Poetry Lovers' Page - Aleksandr Pushkin: "In the Worldly Steppe..."
You are here: Home » Russian Poets » Aleksandr Pushkin » "In the Worldly Steppe..."
It boils and runs, and ripples in a blaze. Exiles, whose fate is doleful and hard. Will always help to quench the thirst of hearts.